Administrative/Biographical HistoryRebecca (née Buckman) Teitelbaum was born in Antwerp in 1909, to Abraham Backmann and Annie (née Stenfeld) Buckman. 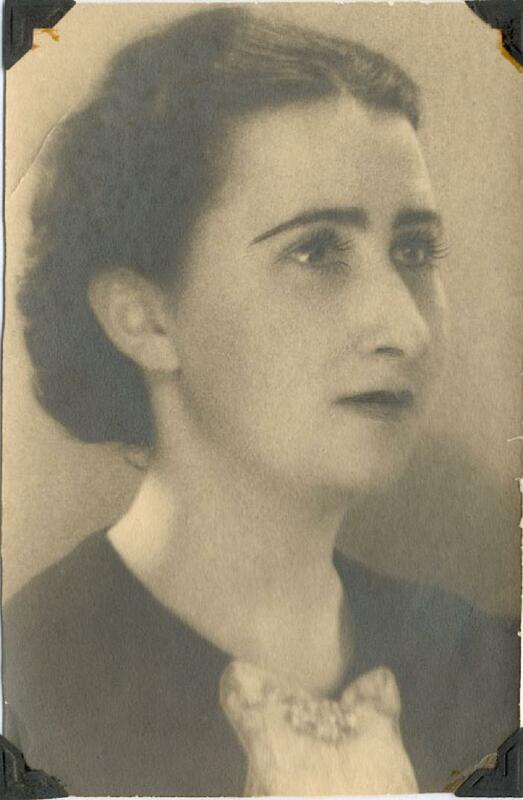 She married Herman Teitelbaum (born in Erdőbénye, Hungary, 1904), on April 13, 1938. ﻿﻿Before the Second World War, Teitelbaum lived in Anderlecht near Brussels and worked in the accounting department of a department store, À l’Innovation, in Brussels. Rebecca and Herman had three children, Anny (b. 1939), Christian (b. 1946) and Shirley (b. 1953), and raised Rebecca's nephew, Alex Buckman (b. 1939) after he lost both his parents in the Holocaust. Rebecca Teitelbaum spent seventeen months in Ravensbrück, a concentration camp for women, where she worked in the office of the Siemens ammunitions factory. Ravensbrück was one of the largest concentration camps in Germany, where approximately 132,000 women, many with children, were imprisoned. About half died from hunger, medical experiments, executions, gassing or on the death marches. As the Allies approached Ravensbrück in March 1945, 24,000 women were forced on death marches to Mecklenburg. Teitelbaum was evacuated on a Red Cross truck. The truck was bombed and she was wounded and taken to Sønderborg Hospital in Copenhagen; she lost her bag, which contained correspondence and her recipe book. Three months later, Teitelbaum returned to Belgium where she was reunited with her husband Herman, daughter Anny, and her orphaned nephew Alex. Two years later a man appeared at her home in Belgium with possessions he had found in a Red Cross truck. Using the names on the letters, and her hospital records, the man traced her to Brussels in order to return her lost things. Teitelbaum and her family emigrated to Montreal via Halifax in 1951, arriving on the ship Conte Biancamano. She became a Canadian citizen in 1957. Teitelbaum passed away in December, 1999, in Ottawa. Scope & ContentFonds consists of records relating to the pre- and post-war experience of Rebecca (née Buckman) Teitelbaum, Herman Teitelbaum and their family. Fonds is arranged into five series: Notebooks (1944–1945), Correspondence (1944–1945), Identification and related records (1938–1974), Photographs (–1947) and Objects . Immediate Source of Acquisition or TransferRecords were donated to the VHEC by Alex Buckman in 1999. Alex Buckman found the recipe book in his aunt Rebecca's belongings in 1997. Two armbands belonging to Jacques Backman, member of the Belgian resistance, were donated in 2018. System of ArrangementFonds was arranged based on categories established when the records were first donated to the VHEC. Item-level descriptions are based on legacy Filemaker Pro database records. Select item descriptions only have been input into Collective Access. Other items have been digitized and scans used to illustrate fonds and series-level descriptions. Consult the archivist for more information. Date of DescriptionCollection arranged in November, 2017 by Shyla Seller. Updated August, 2018 to include description of accrual.